Tuesday, October 8th, between the hours of 8:30 and 10:00pm, Tuesday, October 8th, 8:30 pm. Frist. Shortly after missing the University’s emergency call, and being told by my dad that someone was running rampant with a gun on campus, I found myself barricaded in the women’s bathroom of Frist, B Level. My four Theta friends, their Mandatory Bonding session having been canceled, and two freshman ice hockey players had “jammed” the bathroom door closed with a doorstopper in hopes of stopping the gunman. In reality, this doorstop did essentially nothing to stop multiple groups of Asian women from shoving the door open. 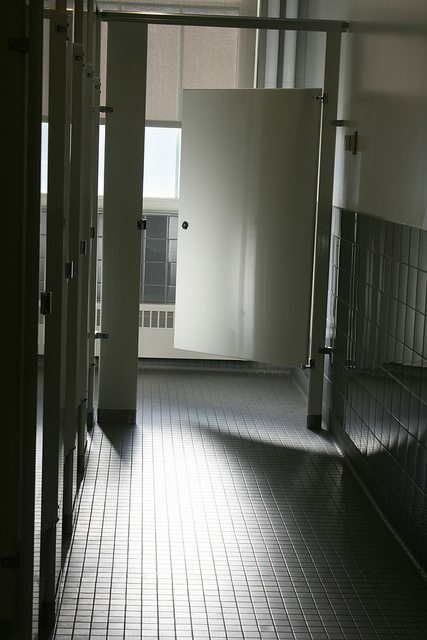 Each group strolled in, as if there wasn’t a gunman on campus, asking us six tentatively, “Can I go…?” pointed to the stall, as if we were put to the task of regulating each stall. And each time the door attempted to be opened, one of the girls would let out a shriek before running as fast as she could into a stall. As if that would keep her safe. The scene around 9:00: I was still apprehensively standing in front of the door-stopped bathroom door as the two hockey freshmen sat on the right wall nervously observing us sophomores. The rest of them were sprawled out on the floor, on Facebook continuing to finish their pledge tasks or on iPhones nervously texting parents. My biggest concern at the time was whether or not it was sanitary to sit on the bathroom floor. After almost getting hit by the opening door, I finally decided to risk my cleanliness and health, and sat on the floor, attempting as well to finish some work for classes the next day; there was no doubt in my mind that classes would be canceled or that campus would be shut down for more than thirty minutes, while P-Safe figured out that the shooting scare was actually born out of someone’s loud ringtone being mistaken by a pedestrian through the dark night as gunshots. Maybe it’s my naiveté to blame, but I was not nearly as scared about the situation on campus as the rest of the Women’s Bathroom. Scares like this have definitely happened to campus before; despite the helicopters that were flying above or the close proximity of the crime scene to my dorm, I was mostly pissed that the gunman had prevented me from being in bed, and now I was forced to sit on the unsanitary bathroom floor, with an uncharged laptop and no headphones. One sophomore in particular did not find the situation humorous at all. On Tuesday night I realized how sheltered I was. I don’t think I’ve ever even seen a real gun in person before, except maybe one in a museum. Princeton is an incredibly safe town in which to grow up; a lot of my friends’ families left their front doors unlocked, because being locked out was a greater threat than being robbed. While we uncomfortably sat in our hideout, making very inappropriate jokes about gun violence, a sophomore almost started crying and decided that she needed to get out of there right now. She proceeded to stand on a toilet, hoist herself over the stall, in an attempt to burrow into the ceiling and somehow crawl out of there. Another sophomore friend helped hoist her up, and she managed to push a ceiling panel out. The bystanders, myself included, were laughing. “This is not funny! It’s not a joke and stop being so loud – he’ll hear you!” she cried hysterically (also assuming that the gunman was a man). Throughout all this we were Vine-ing and Snapchat-ing. To no one’s surprise (or at least not to mine), the emails from Deans and P-Safe stopped coming and we decided run back to the safest place on campus: Forbes Annex. I made the executive decision, deciding to believe that the warning was like the bomb scare on campus over the summer, and made the grueling walk up to Witherspoon. We all made it safely back to our beds; a few days later I heard that the noise had been a mishearing of a construction worker working slightly too forcefully with his hammer and chisel near Nassau Hall. Do you enjoy reading the Nass? Please consider donating a small amount to help support independent journalism at Princeton and whitelist our site. Bot check: What is the name of the farthest residential college from central campus?